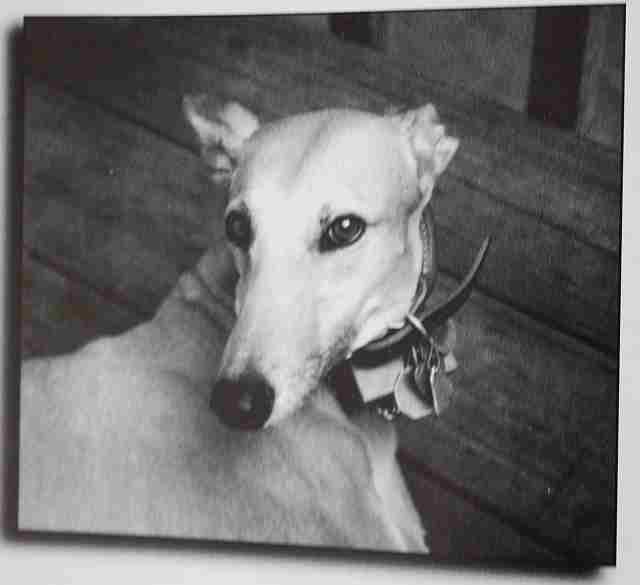 Our first greyhound died when she was days shy of 13, a respectable age for a greyhound. I knew almost immediately that I wanted to write something about her, but at the time, I did not know why. I had never been moved to write about the death of a pet before, even though four dogs and five cats from our family preceded Shane to animal heaven. As I reflected on her death, I discovered why I needed to write about Shane: Shane changed my life in a profound way. What she taught me explains why I grieve and why deep expressions of grief are indeed appropriate for lost pets, even though people sometimes scoff at such mourning. A remark in the February 1997 issue of Your Dog, the newsletter of Tufts University School of Veterinary Medicine — a journal I highly recommend, by the way — reports, “Although grief is a normal response to the loss of a pet, some people feel guilty or confused about the intensity of their emotional response — especially if others trivialize the loss with comments such as, ‘It was only a dog.’ ” Most authorities agree that grief for the loss of an animal should be acknowledged and respected, but articles on the subject are often short on the “why’s.” My first greyhound, Shane, taught me why. Among other lessons, Shane taught me to know another species, to respect our environment, and to admire the beauty of a harsh natural world. First, Shane taught me what it’s like to be a dog. To know her I had to see life through her eyes. The experience was exhilarating. Only someone who has loved a pet greatly will understand what I am about to say, but I came to know Shane intimately, to truly understand her emotional needs as well as her physical ones. Such understanding seemed miraculous. Subtle changes in her activity level, like resting just a little more than usual, meant depression. She loved running more than life, it seemed, so when she became a little inactive, off we went to the ballpark, and she was perky again. Thanks to Shane I am now more sensitive to the body language of dogs at my adoption group’s retirement kennel as well. A retiree there, Mohican Akin, was a crate wetter, and deemed unadoptable. I had the idea that he wet his crate because he was depressed. Upon returning to his crate, he would barely nibble at the biscuit prompt that cued him in, turn slowly toward the back of his crate and lie sideways looking off into the distance without making eye contact with me. Last September, he came to live with us, and I quickly learned that my suspicions were correct. Once quite happy in a “real” home, he became very active and playful. What’s more, he has been relatively easy to housebreak, having soiled his blanket only on his first night here. Shane taught me both that dogs have an inner life and more profoundly that it is possible to understand this life. In bringing me out of my isolation from the other animals on the planet, Shane raised my consciousness about our environmental responsibilities. While I might have recycled waste prior to owning Shane because it’s “the right thing to do,” now I do it more happily. In addition, I eat much less meat and worry lots more about the treatment of animals farmed for food. I buy the more expensive eggs and chicken if they claim to be free range. I read labels and try to avoid those manufacturers on the PETA (People for the Ethical Treatment of Animals) hit list. I now contribute pretty regularly to various pet rescue groups. I have come to feel affection for all breeds of dogs and cats, where I used to feel mainly indifference. I have adopted a number of greyhounds since taking Shane in almost 11 years ago. Is this nobility? Hardly, it’s not even very generous. I loved Shane deeply and have loved those who have followed her. It’s not hard to do things to protect those we love. By letting me love her and know her, Shane instilled all these behaviors in me. Finally, Shane taught me that there is something profoundly beautiful about the purity of the natural world, about its innocent motives, about its lack of deception. There is no mystery why animals kill one another brutally; they do so to survive. First, they must eat. However, unlike man, they do not kill more than they can eat or that won’t be finished by some other species. Nature’s nice like that. And second, animals must perpetuate their species. Their power struggles revolve exclusively around jockeying for the best food or the most fertile mate, never in pursuit of more nuclear weapons or oil. Undeniably, there is a harshness in the natural world, but its simplicity is magnificent. Towards the end of her life, for apparently no reason, Shane, who was failing, would stand back from her bowl at dinnertime and bark meanly at the other dogs who were all busy eating. But we who fed them knew why Shane barked. Dogs do not take special care of their frail or elderly members. In the wild, to do so would mean certain death when fleeing a predator, and so our dogs were not indulgent of Shane who ate more slowly and did not have the energy of a young dog. Were we not there, they’d surely have got her food as soon as they were done with their own. Knowing this, Shane always tried to put up a good offensive front before they could attack. In the wild, Shane would have died long before her 13 years. Domesticated, Shane taught us some lessons of the wild and helped us understand the purity of nature. A year after we adopted Shane, the adoption group we’d adopted her from sent us a questionnaire. In one response, I remember writing, “Shane’s the perfect dog who always does the right thing.” Shane enriched my life in a way I did not think possible. I will always be grateful and different because of her. My vet, who understands these same truths about animals, once told me this story. Called in the middle of the night to attend to a dog who’d been hit by a car, he agreed to meet the owner in 15 minutes at the animal hospital. He hurried over, opened up, turned on the lights, readied his emergency equipment and waited, and waited, and waited. The people never showed up or even phoned. “A dog would never do that to you,” he quipped. That may be an exaggeration. A good meal en route or a good chase after an appealing chipmunk might have deterred the loyal dog, but he would have shown up eventually. Those pets who have learned the ingrained habit of love wait at our doors, listen for our cars, lie at our feet. We know their affection and are grateful for it. So is it appropriate to grieve deeply for those creatures who teach us so much, who give pleasure daily? I’d say so. This tribute to Shane is truly touching and having lost my first two greys, hits very close to home. Greys also changed my life in all the best ways. I have always loved animals, but Greys are the absolute loves of my life. I currently have two, once of whom can be a challenge, but is greatly loved and one little female whom I truly love more that I can ever say. She is the sweetest, most beautiful, most intelligent and loving creature on the planet. I can truly say that I have appreciated every single day of the almost six years we have been owned by her. She is my little soul mate! I identified with everything you said about Shane. Bless her and bless you.